2. Lightly grease baking sheet and set aside. 3. In a small bowl, combine flour, egg and rosemary. 4. Stir in the vegetables. (Optional: you can steam the veggies before mixing in to ensure a mushier, smoother batter). 5. Place in small teaspoon sized dollops on the baking sheet. 7. Allow to cool and harden. Then nibble away! 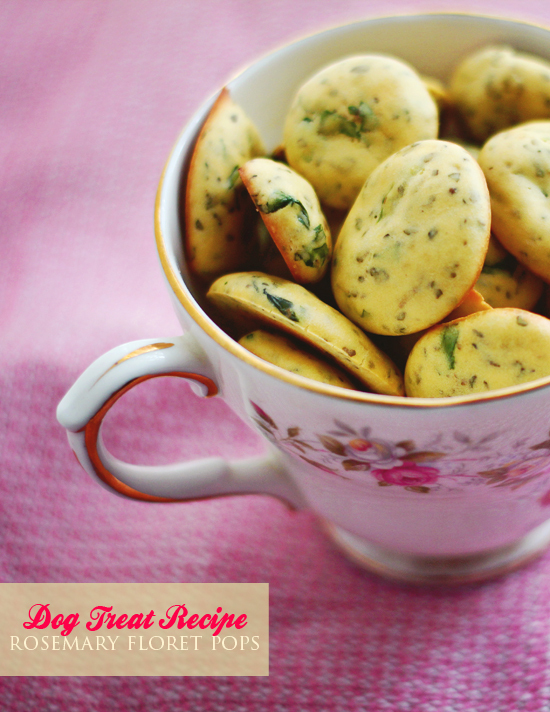 Rosemary is high in calcium and iron for dogs, making it a must-have herb to sprinkle in at every dog dining occasion! I think your recipe is lacking some liquid. It didn’t come out like a batter at all. Oh dear, really? This recipe works for us. What did your mixture turn out like? We might have some advice! Will the consistency turn out okay if I use organic whole wheat flour instead of chickpea flour? I made the recipe over the weekend, doubled the batch because I have two fairly sizable dogs; one is 75 lbs and other is 45 lbs. The batch didn’t come out like yours (all pretty and white looking), but the boys absolutely loved the treats nevertheless. Is there a way I can post my batch result on here somehow?